New research has found that music and food are more inextricably linked than we previously thought. WHAT AN AMAZING DISCOVERY! Two of my favourite things, music and food, are united in beautiful matrimony right here. How marvellous this is! Let's celebrate! LET'S HAVE A FEAST! According to a blog post on Scientific American, the news is that music – or more accurately, sounds – are more closely linked to the sense of taste than was first imagined. Usually the domain of synesthetes – people with the neurological phenomenon (or what some would term a "gift") that allows them to experience sounds as colours, sights as tastes, smells as sound, etc. – the apparent close association of these two senses in regular, everyday, average people is quite amazing. 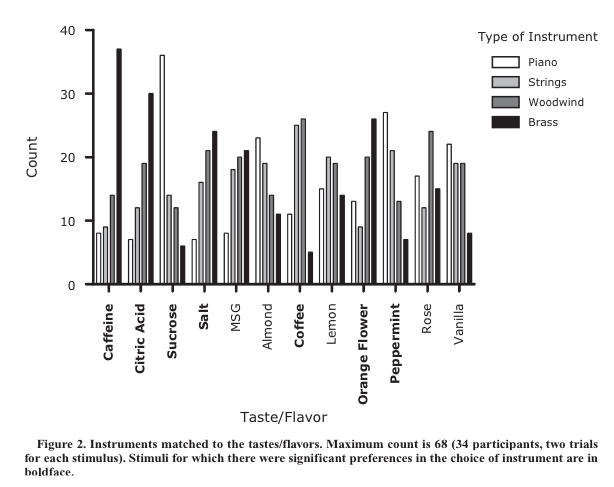 There may be implicit associations between taste and pitch. High pitched sounds are mainly associated with sweet and sour tasting foods while low pitched notes are more commonly paired with more bitter and umami tastes. In one study, participants tasted pieces of cinder toffee while listening to different soundtracks – one with higher and one with lower pitched tones. The toffee was then rated on a scale that ranged from bitter to sweet. The result was a bittersweet symphony, showing that the participants found the toffee sweeter when paired with higher pitches and more bitter when accompanied by lower pitches. Unbeknownst to them, the toffee was identical – it was only the sound that had changed. What the hell?! How cool is that? And what's more, there's a graph to go with it. Fun! It demonstrates that the sound of brass instruments, for example, goes great with "caffeine" (not a taste, but ok) and also with citric acid; also, if you want a heightened experience of peppermint flavours, listen to some piano music. I love talking about music in terms of its flavours, and I often link it to tastes or an actual particular food, so this research to me is super interesting. More on this at The Creators Project.